August 29th in Photo Plugins, Premium Plug-ins by Wordpress Jedi . Have you seen these new Web 2.0 sites that come out with all kinds of cool features? You have probably seen the photo sites that have pictures that literally pop out when you take your cursor over them. If you are running a photo blog or you tend to have a lot of picture on your personal or business blog, I know you would love to have that feature too. I literally spent weeks searching for a programmer to implement that feature for me but guys at rentacoder were asking for $200 to get that done for me. I got lucky when I found Viva Carousel. on the very same page, I found Viva Zoom. 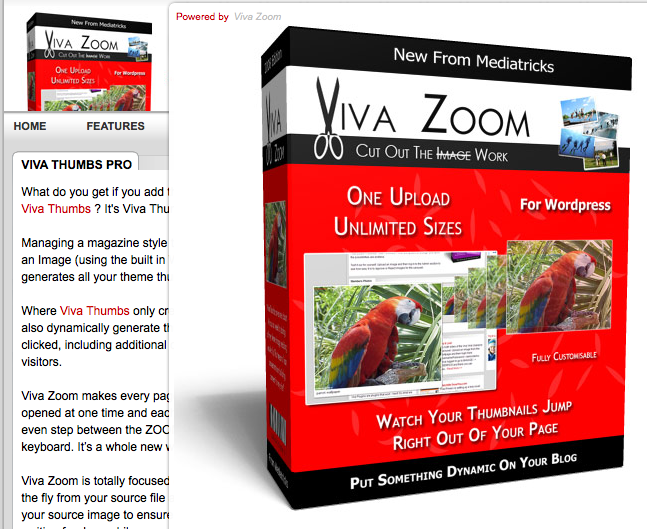 Viva Zoom is surprisingly easy to use. You basically upload your photos and the plugin automatically creates thumbnail for each image, and then your images pop out on your pages when clicked (see an example below). That’s pretty much why it’s called Viva Zoom. You can Zoom in on your images. You can also move the thumbnails and open multiple ones. Now I am going to be honest with you. I don’t run a heavy photo blog per se’. But whatever kind of blog you run is going to look more professional with this plugin. It’s just more attractive. Price: You can currently get this for a single site for $19.95 (usually retails for $24.95), but the developer license can get expensive. I personally can’t handle more than a couple of blogs, but if you want to use this plugin on all your sites, then you should consider the more expensive licenses. Verdict: 4.75/5. The plugin is simple to use in general and does what it’s supposed to do magnificently. It does not however support external images (linking to images hosting on let’s say CNN). But if you upload the images to your server, it works like a charm. Best of all it’s very affordable.